The Twenty-8-Eight Automatic is a lively and sunny timepiece, remarkably refined and sober. The face of the watch is artistically divided in two different guilloché zones. In the centre, a light flame pattern provides incredible life to the dial as the slightest wrist movement will animate the flames in graceful reflections. The second pattern, at the perimeter, takes the form of a regular and reassuring sunray that structures the whole design. Flames and sunrays are separated by a fine circle applique that gives a final touch of shiny elegance and echoes the thin and polished columns on the bezel. Time has never been more readable as large Roman numerals are positioned on the four cardinal points and discretely interconnected by small Arabic numerals positioned at five minutes intervals. 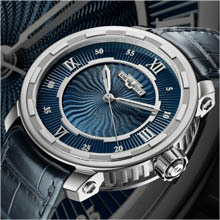 The Twenty-8-Eight Automatic is an “urban classic” with a 43 mm round case made in 18-carat white gold. Offering a subtle combination of character and refinement, the design of the  Twenty-8-Eight collection is sober and balanced. Presenting a slightly thinner case (10,28 mm) than the Academia collection as well as more discrete columns on its flanks, the Twenty-8-Eight collection gives a fascinating impression of lightness. Elegant and streamlined lugs achieve to complete the design with perfect proportions and offer a remarkable comfort of wearing. 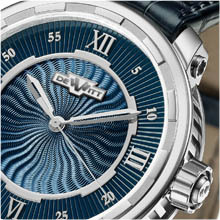 However, the strong DNA, so characteristic of DeWitt watches, remains fully recognizable. The Twenty-8-Eight Automatic houses a solid and reliable calibre and displays hours, minutes and centre seconds. The hours and minutes hands are open-worked and in the shape of  two-edged swords whereas the seconds hand, elegant and thin, gracefully glides round the dial. The Twenty-8-Eight Automatic fully complies with very demanding finishing norms of the DeWitt  Manufacture: satin-brushed surfaces, polishing and bevelling. The quality of the finishing can be observed through the sapphire crystal back, which also unveils a fine DeWitt rotor, designed in-house. Also, two miniature “W” signatures are to be found on the crown and on the golden buckle. Last but not least, just as any DeWitt watch, it is entirely assembled, adjusted and tested by a single master watchmaker, from A to Z. A summery, “blue jeans” version with light blue waves in the centre and an intense deep blue at the perimeter. The rhodium plated numerals, circle applique and hands provide perfect contrasts and dazzling reflections. 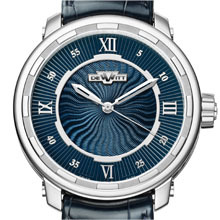 Dial: Two-zone guilloche: internal with flame guilloche pattern, external with baguette guilloche pattern. Circle applique with columns. Large Roman numerals at four cardinal points and small Arabic numerals positioned at five minutes intervals. Hands: Hours and Minutes: open-worked hands in the shape of two-edged swords. Seconds: thin and elegant.